Join the CU Catalan Club in celebrating Diada de Sant Jordi (Saint George's Day), a festive day in Catalonia held on April 23 along with El dia del Llibre (World Book Day) and La fira de les Roses (Rose Fair)—symbols of culture and love and a day that reclaims the Catalan culture and identity. Sant Jordi represents the day of the beloved, and, since the 15th century, it is tradition for men to give a red rose to their beloved on this day. Additionally, the custom of giving a book to men was added in 1923 to commemorate the nearly simultaneous deaths of two distinguished writers, Miguel de Cervantes and William Shakespeare on April 23, 1616. 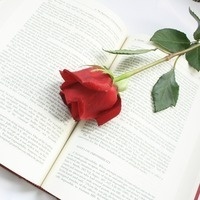 During this day, many people go to festive markets to buy books and roses. These markets are held in the center of Catalan towns and villages. At the same time, it is tradition to organize a literature competition in high schools. Our event is a great opportunity for all students at CU to practice their writing skills through the literary contest of Jocs Florals we are holding. There are three categories in which you can submit an open topic and genre literature creation. Each category offers a $75 gift card to the CU Book Store! The event also provides attendees an opportunity to meet Catalan natives, practice their speaking skills and become more familiar with the culture. According to our tradition, the club will be giving roses around campus during the morning of April 23.